The Letters of Marie Alexandrovna, Grand Duchess of Russia, Duchess of Edinburgh and of Saxe-Coburg and Gotha, and of her daughter, Marie, Crown Princess of Romania. The Duchess of Edinburgh was a diligent and constant letter-writer. She was also outspoken, humorous and a keen observer. 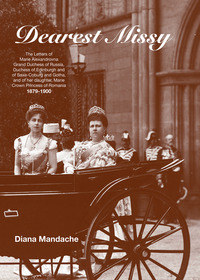 Her letters to her daughter Marie, future Queen of Romania, have been transcribed and edited by Romanian historian Diana Mandache. As an extra bonus, many of the letters from daughter to mother have also survived and are included in this unique documentation of a life and an era long since gone.